First impressions don’t say anything and they say everything. You can never recapture the first impression of a person or a place, the strangeness that existed before the mind creates its imprint that then becomes the indelible preconception that trumps any new sensory impressions. The soldiers in the airport who still sport the red epaulets recalling the images of North Vietnamese soldiers during the war and the stained teeth of the immigration official who examines your visa are the very first impressions you have. The Hanoi airport is still a bit of a boondock, a backwater, compared to Seoul with its acres of duty free shops. Hanoi is plainly mercantile with the usual Canon and Yamaha signs, but at night the darkness of the narrow Pagoda like structures which still populate the outskirts are only broken by neon signs for karaoke or massage. The karaoke is ubiquitous, one empty storefront after another competing for market share. 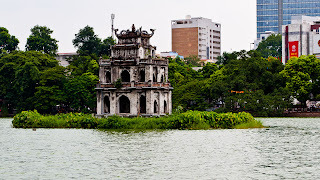 Hoan Kiem is the lake in the center of Hanoi. On a cold rainy Saturday young brides in sleeveless dresses are photographed one block away, in front Hanoi’s most elegant remnant of colonialism, the famed Metropole Hotel. “You looking for girls,” a forlorn character calls out, as a legless man in a wheelchair that looks like a wheelbarrow aggressively hawks postcards. And I'm curious: what did Hanoi smell like? I love these travel journals. I don't need a postcard, as your prose is picture-perfect.